The edX platform hosts Hong Kong Cinema through a Global Lens, which is free of charge on the Internet. Lively and student-centered, this MOOC is appropriate for secondary, tertiary, and lifelong learners from all corners of the globe, who have a good command of the English language. Teachers are welcome and encouraged to adapt various modules and materials for their own classroom or e-learning needs. 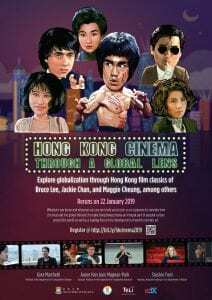 The course explores globalization through Hong Kong cinema featuring crisp analyses of the actors and filmmakers whose lives and films connect the local Hong Kong scene to global histories, events, and trends. Throughout the six-week course, students will encounter stars including Bruce Lee, Jackie Chan, and Maggie Cheung as well as award-winning directors such as John Woo, Mabel Cheung, Andrew Lau, and Wong Kar Wai. Each week a new film showcases talents, themes, and local-global connections. The cinematic canvas ranges from martial arts and heroic bloodshed films to romantic comedies and migration melodramas. Covering a range of topics, genres, and films, the course features demonstrations of swordplay and action choreography, tutors students in the close analysis of film techniques, uncovers the reasons for the worldwide appeal of genres such as the Kung fu film, and nurtures a comparative and critical understanding of issues of gender, race, and migration. Interviews with film professionals such as directors Mabel Cheung and Andrew Lau, producer John Sham, film festival director Roger Garcia, and other guests, offer candid insights about the industry. Lively forum discussion an weekly round-up videos keep the course up-to-date with the latest information on current trends in Hong Kong film. Posted in Education, Film, Hong Kong	Bookmark the permalink.